We’ve incorporated these components into our courses to create a supportive, outcome-oriented online learning experience that people love. Edmaker started as an online education consultancy, and that part of our business continues to grow. We help companies craft custom corporate training for their staff and we also provide businesses with a unique way to engage with their customers. We can help you envision the best learning experience for your audience and business goals. You provide subject matter guidance, and we create courses that inspire your audience and achieve results. We manage all operations for your school and help identify opportunities for growth. We create education that matches our clients' brand and audience needs. Our online learning experiences engage audiences, train employees, and generate leads. Here's what our clients and 10,000 users had to say. They ❤ us. 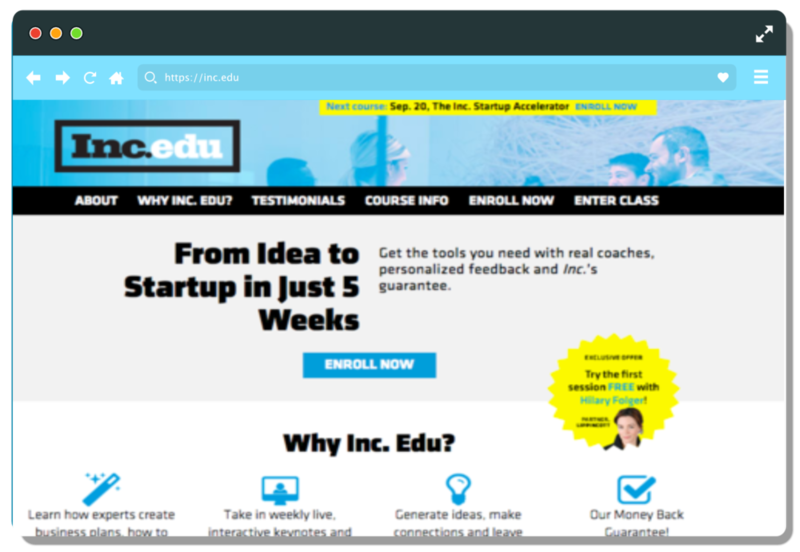 Inc. hosted leading CEOs to teach hundreds of startup founders in a live, online coaching environment that spawned new businesses and extended the Inc. events business. —Eric Schurenberg, President and Editor-In-Chief, Inc.
Library Journal developed their online professional development program from idea to successful new revenue line within months. Executed on the strategic opportunity to build and run a successful, varied education program for librarians learning leadership, space design, and new technology and innovation. "You were the most responsive, best organized and most supportive team I've encountered anywhere." “Edmaker was an invaluable partner in launching our online learning initiative, from strategic planning and project management, to program development and speaker recruitment." Library Journal and School Library Journal, Media Source Inc.
Moxie Mentoring transformed their best-in-class in-person training into instructor-led online workshops to coach and support employees learning new skills.